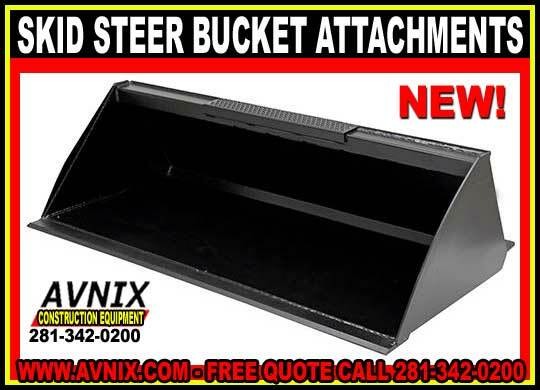 Home » Heavy Duty Steel Skid Steer Bucket Attachments On Sale Now! Heavy Duty Steel Skid Steer Bucket Attachments On Sale Now! When shopping for the right bucket attachment for your skid loader, you should know a few things that might prove to be very important on your shopping trip. First, you must decide what you are planning on using the bucket attachment for. How many pounds of material are you planning on moving? What are you planning on lifting? By knowing the solution to these questions, you will have a better plan of the type of skid steer bucket attachment that you require. 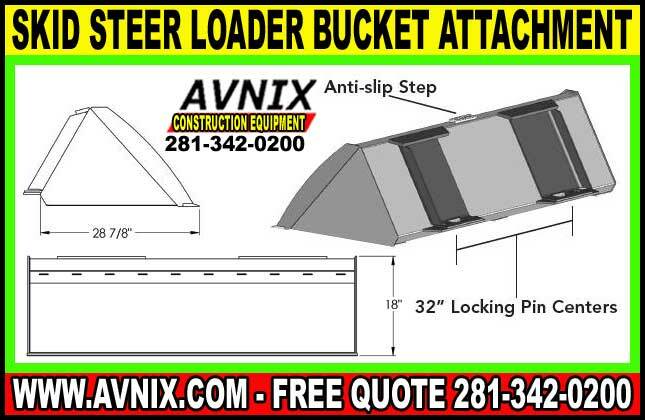 Avnix skid steer buckets vary in design, width, height, length an capacity; consequently, you must have an idea of how you are going to use our skid steer bucket. Our bucket models vary as you will need a different size bucket or other features for the variety of jobs that can be done using a skid steer bucket. Skid steer loader buckets that are used for dirt moving have lower sides and back, which makes the loading and unloading a lot quicker and safer for the skid steer driver. Snow buckets, skeleton buckets, fertilizer buckets, and other comparable buckets are a bit larger; as a result, they allow workers to carry more material with each load. Utility buckets are inclined to be deeper carry more material without taking the possibility on spilling the product. In addition to the different skid loader buckets that are talked about above, there are even more offered on the market, like buckets for root grappling, root rakes and even buckets for concrete placement. If you have a certain job to be done more than likely, there’s an loader attachment made for that need, sometimes you could have to shop around in order to locate it; however, in the end, locating the right skid steer attachment might need just a little extra effort on your part. You can find skid bucket attachments in a range of different prices, therefore make certain that you set up a budget. Still, no matter which way you settle on to go, one thing is for sure, you will be able to get more use from your skid steer loader by purchasing this adaptable attachment.